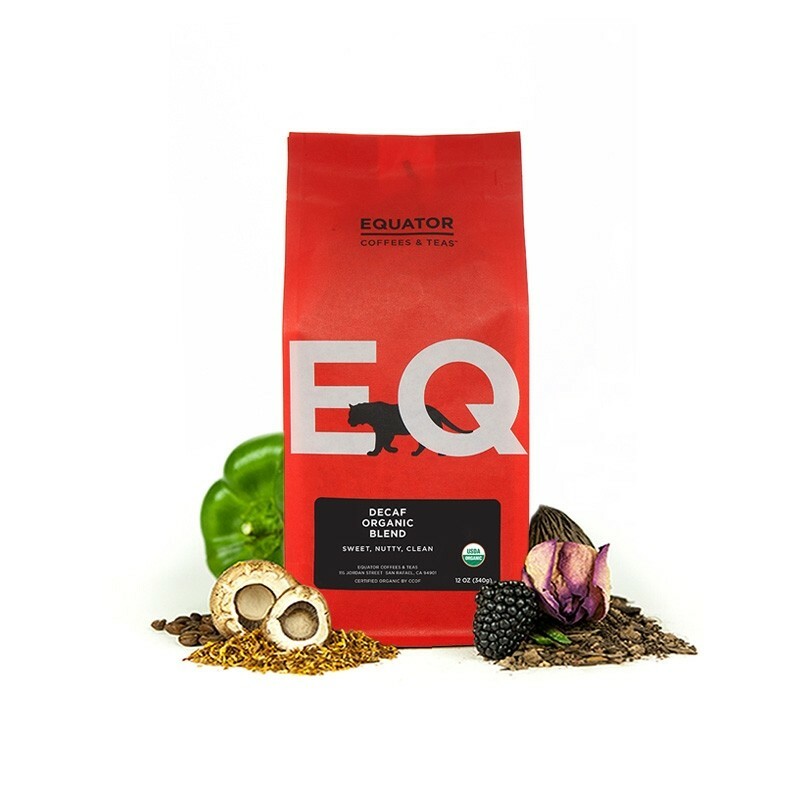 This is the Decaf Organic Blend brought to you by Equator Coffees & Teas. The Decaf Organic Blend is comprised of certified Organic coffees from Indonesia and Latin America that were decaffeinated using the natural Water Process method. You can't go wrong with this clean and sweet coffee with herbal, nutty top notes complimented by a teak-like earth tone at the base. 3.5. Again darker than I expected it to be but an easy pour for espresso and nice and rich. This stuff was really bland tasting. Maybe because it is decaf? That shouldn't matter right? Or maybe I need to use more of it to get the same flavor? Still - it didn't have the same wonderful aroma right when you open the bag. No more decaf for now. This blend is definitely my favorite decaf bled of all that have received. Really strong and bold flavor and I can't get enough of it!! This has been the best tasting beans by far that I have received. More like this one. Loved it. I want more. Beautiful lustre in beans. Warm caramel and cocoa. I've had some great decaf coffee's, this wasn't one. Very dark. Very oily. The tasting notes weren't coming through. Sadly had to gift this coffee to someone who likes appreciates dark coffees. A person can really taste the freshness of the coffee beans. I like it very much. It has a lot of flavor for a decafe coffee. i like an 'earthy' coffee. One of the best coffees I have ever had. Love it! I was able to pick up on the "earthy" tones of this coffee. I enjoyed reading the blog about learning how to understand the different notes and flavors of coffee. I was struck by the idea of attaching a memory or thought to the experience. When I first smelled this coffee, I was reminded of my grandmother who was a "Yuban" fan. I can still to this day remember the many cups ( and cans ) of coffee that I shared with her. This is a mellow coffee to me, low acidity. I have very much enjoyed it. I don't think there is going to be a coffee I don't like, I am excited to try what comes my way. Very nice flavor, with pleasant finish. Just a bit lighter roast than we prefer. Loved this one, great flavor, not bitter or acidic. More like this next time, please! I feel like it is slightly bitter on back of my tongue with a mild sour after taste. I like it but I think I would prefer more brightness of citrus or fruit. I really like the clean and clear mouth feel and the sweetness is about perfect. I love "nutty" undertones, but found the herbal flavor to be too intense for me to enjoy this coffee on its own. When my husband tasted it he said he knew I wouldn't like it because it reminded him of the "El Salvadoran Fruit Bomb" coffee that wasn't my fave from our old neighborhood roastery. I do think it's awesome that it's decaffeinated with water instead of chemicals! I was excited to try this because I remember liking the roaster from my discovery box. It tasted quite weak though. Too bitter and acidic tasting. A little too sweet. I am using a chemex so not sure these beans were ideal for that - too oily?